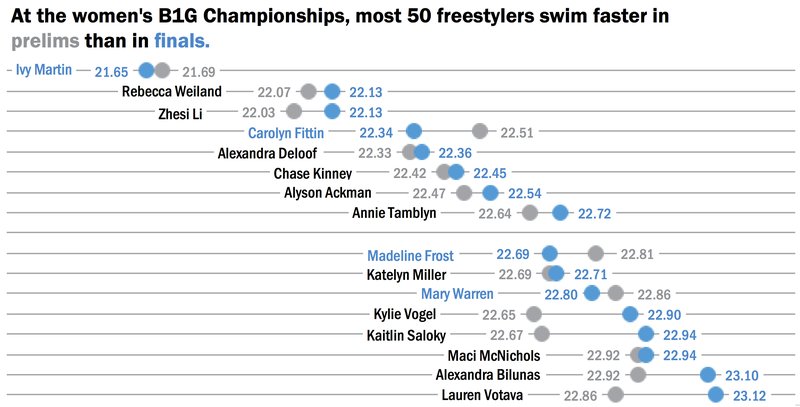 I have always contended that most 50-freestylers swim faster in the morning prelims session of a championship meet, and these data from today’s women’s B1G championship would seem to support that notion. Amongst the top 16 scoring swimmers, only four swimmers improved on their prelims time; two of those four swimmers were the first and ninth place finishers. I will speculate that is because those swimmers are racing to win their respective finals (and consolation finals) during the night-time session. To those unfamiliar with swimming, in the prelims/finals system, a swimmer who finishes between 1st and 8th place in prelims swims in the final heat at night. In the finals, it’s a whole new race for 1st place. Swimmers who place between 9th and 16th place in prelims swim in the consolation final heat at night, and duke it out for 9th-16th place. These night-time swims matter, because the night-time results are used to determine the points achieved by each swimmer, which then tally up for their respective teams, thus determining the meet champion. During the night-time finals swims, athletes are “locked-in” to their respective heats, meaning that if the 8th place swimmer in the finals heat swims slower than the 9th place swimmer in the consolation finals heat, it does not matter for sake of point scoring. The graph shows the top 16 women’s 50 freestyle swimmers, with the morning prelims time displayed in grey, and the night-time finals time displayed in blue. To speculate on what accounts for the night-time slow-down, perhaps 50-freestylers are fresher in the morning swim and get their best swim then. Or perhaps it owes to the short duration of the event, and that the 50 is not as taxing on the body as other longer events. Perhaps most swimmers just go all-out and hold nothing back in the morning prelims swim. Although coaches, parents, and fans love to speculate on why this might be happening, I’m interested to see if this relationship between morning and night swims holds up throughout the course of the meet. The data visualization idea comes courtesy of Stephanie Evergreen (Evergreen Data | Kalamazoo, MI).